These portable and marine-designed systems go way beyond the boat stereos of the not so distant past. 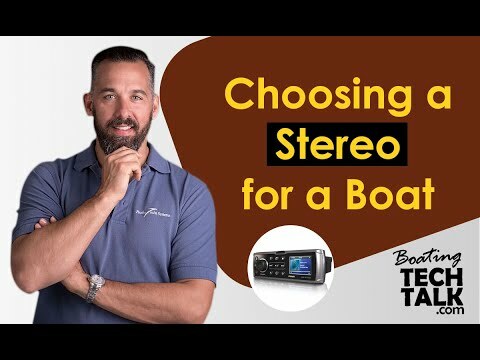 For those who enjoy listening to your favourite tunes when out on the water, the standard car stereo system installed in many boats is a great option. However, modern technology now offers some exciting new options, including added safety features, which can bring your listening experience to a new level. Let’s take a look at the options for your sound system and portable music players. Wired, Docked, Wifi or Bluetooth? such as zones, bass, and treble. here are various pros and cons to consider with wired, docked, WiFi, and Bluetooth connections when researchingsound systems. Many sound systems have an included cable that can connect from the headphone jack of a portable music player to the speakers. This allows access to all the music in your portable library. Auxiliary-in cables from the headphone jack limit the sound quality and tie your device to the sound system. If you want to change a song, you must be able to reach your music player. In the case of an iPod or iPhone you can get much higher sound quality by connecting through the dock port instead of the headphone jack. Fusion and Lowrance both offer enclosed waterproof docks that offer these connections as part of their sound system solutions. These docks protect your portable music player and give you access to all of the music loaded on your player through an easy to navigate menu on the sound system. Typically, the trade-off with docks is that your music player is nolonger portable. One of the most significant technological improvements is the capability of a portable music player to wirelessly stream audio to your sound system. Using an accessory device, the music is transferred live over a wireless connection to the speakers just as it’s about to be played. It is stored and controlled on your portable player, but played from the sound system. This means that you can carry your player with you and have access to all the content and playlists on your portable media player, but still have the music come out of your sound system. The downside of streaming audio is two-fold. Like the auxiliary cables that came before it, the audio quality is limited by the headphone jack connection. You also don’t have access to modern digital media features such as album art on your sound system, so, in the end, you basically just get the sound. WiFi and Bluetooth streaming allows you to use your device around the boat and play your music from anywhere. There’s nothing quite like choosing a song from the bow, while your speakers and stereo system are snug in the cabin. It should be noted that Bluetooth connections typically have a shorter range than WiFi connections. This brings us to the newest devices. Sound systems are being built that are controllable by apps, released by the sound system manufacturer, for your tablet, phone, or chartplotter. Through WiFi, you can use these apps to access and control your sound system remotely, as long as you’re within range of the sound system’s wireless router. The future possibilities are endless, from choosing a radio station, selecting a sound source such as your personal music player, or adjusting sound system treble and bass mix and zone control settings. If you have a dock with a portable music player in it, you can use the app on a second portable device to view album art, or pick a song to play from your library on the docked device. The typical remote included with a sound system may have some of these settings available, but they definitely don’t include album art from anywhere, and typically require a line-of-sight connection. Some systems make the same functionality available over a wired network, for example with chartplotters or wired remote sound system control stations. While this is less convenient since you don’t have the same portability, it does protect your tablet or smartphone from the elements. Finally, many devices are now supporting remote viewing of video content from a docked portable media player. Plug your media player into the sound system, and watch your movie on a remote colour screen or full-size television that also connects to the sound system. 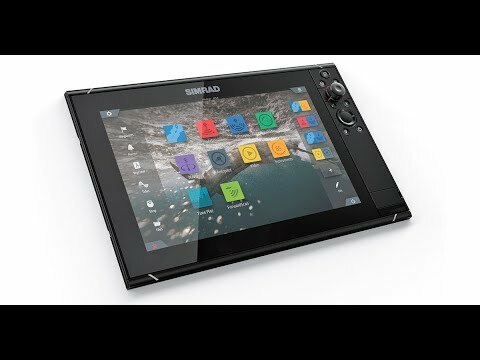 You can even adjust the bass with your tablet! We all need to keep our eye out for issues that may develop from having media content on navigation devices. Already, the proliferation of WiFi networks is causing problems. Wireless devices such as laptops have to choose between connecting to an internet hotspot or a device control hotspot, for example the one that is generated by the Fusion 700 sound system. But the next generation, which is more integrated, is looking rather rosy, and is a huge step up from audio controllers that used to be limited to play, pause, and next track functions. The benefit of using zones and faders is that each zone can have different volumes. Newer stereo systems have multi-zone controls that let you control each zone individually. A typical configuration might have two zones, for which you can wire the speakers to have logical zones such as the top deck, flybridge, cabin, or cockpit. Want the music at the helm to be quiet so you can hear the VHF? Turn down the volume for that zone using the fader settings on your system. The best part is these settings are frequently saved, so as you adjust the volume the zones will scale accordingly, so, for example, the helm will always be quieter than the deck speakers. Some radios integrate VHF receivers as well as AM/FM. With this feature integrated into the stereo system, which is what Fusion has done, the VHF can be played over the sound system. Being able to hear the forecasts, local traffic, and other marine information through the speakers anywhere on the boat is very convenient and provides a safety feature. However, you cannot make VHF calls from your stereo system. The Fusion has a call answering function for a docked iPhone, which dims the music automatically when the phone rings, allowing you to answer the call. When using this feature, there will likely be a delay answering as you rush to remove the phone from the Fusion dock. We’d recommend using a Bluetooth headset to avoid a scramble for the phone. About the author: Jeff Cote is a systems design engineer and owner of Pacific Yacht Systems, a full service shop delivering marine electrical and navigation solutions for recreational boats. This is the first in a new series of columns on thechanging world of technology and boating. "PYS made sure I understood what the end result would be and…"
Beneteau Idylle 51 - "Brigadoon"
"I would absolutely recommend PYS to anybody for all their…"